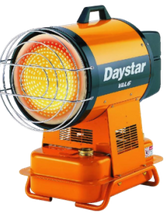 The Daystar brings you infrared heat as well as forced air heat. You may run this unit, as well as all the Val 6 heaters, with an A/C inverter. 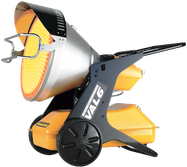 The Daystar is the most portable heater in the Val 6 line. The MPX is similar to the Daystar, just bigger and better. 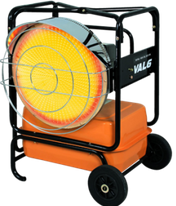 It has the widest angle range (45 degrees) of any of the VAL 6 heaters, yet is small enough to fit in small places. The KBE5S is a single setting standard radiant heater. 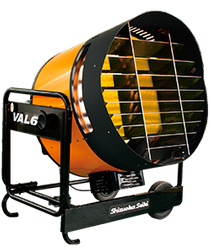 Just as the other Val 6 heaters, there's no odor or smoke while running it. The KBE5L heater has a 2-stage heat output and equips a larger tank enabling it to operate continuously for about 16 hours in high and 20 hours in low. 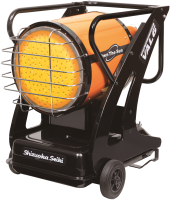 The EPX is the most technologically advanced Val 6 heater, as well as the most powerful and efficient. It has an over-voltage detector, a built in thermostat, an advanced monitoring system, and the largest radiation disk of the whole Val 6 line-up. The GN5 & GP5 heater are stated to be the cleanest most efficient heaters ever. The premixed gas combustion allows for minimal operation noise and produces less than 1ppm of carbon monoxide, which is 10-20x less than typical torpedo-style heater. Looking for a quick, temporary heating solution? 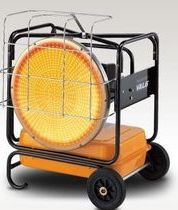 The Alkota industrial space heaters are a must have for those times when a bit extra or emergency heat is needed. These units offer instant heated air at a low cost and run on kerosene or #1 diesel fuel and plug into the standard grounded 110 volt outlet. 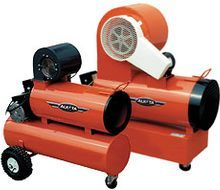 The Alkota Space Heater Model 150 heating capacity is at 150,000 BTU/hr and the Model 210 at 210,000 BTU/hr. © 2019 Express Pressure Washers, Inc.. All Rights Reserved.